Coach Donovan shares concepts for winning transition basketball that are usable at any level of basketball! The basis for his offensive philosophy is imbedded in fundamental skill and player mentality. Donovan demonstrates the drills that helped turn his inexperienced team into a "teamwork machine." 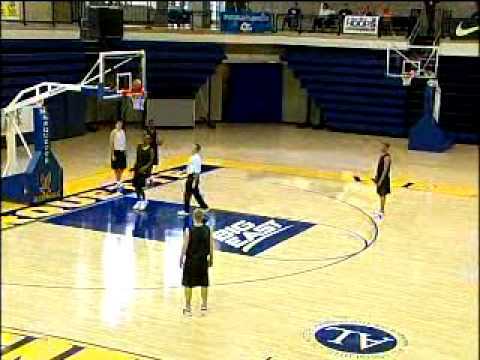 Practice drills are the Two-Man Sideline drill, Three-Man Sideline drill and Five Cycles drill. A popular peer pressure drill is the "Laker Fastbreak" drill, where the ball is not allowed to touch the floor. The Gator transition game is based on concepts instead of patterns, which offers many obstacles for the defense. Transition concepts allow players the freedom to create and use their individual talents on the floor, forcing the defense to react to offensive movements. Also, it contains options for all five players. Pick and roll, pick and step back, post ups, penetrate and pitch, quick ball reversal and multiple 3-point opportunities present themselves in this system. This DVD introduces a potent and flexible style of play that led Florida to the National Championship. Use the concepts presented to score more points with this exciting brand of basketball!